Few people living in Oak Lodge today will likely remember Superior Dairy. 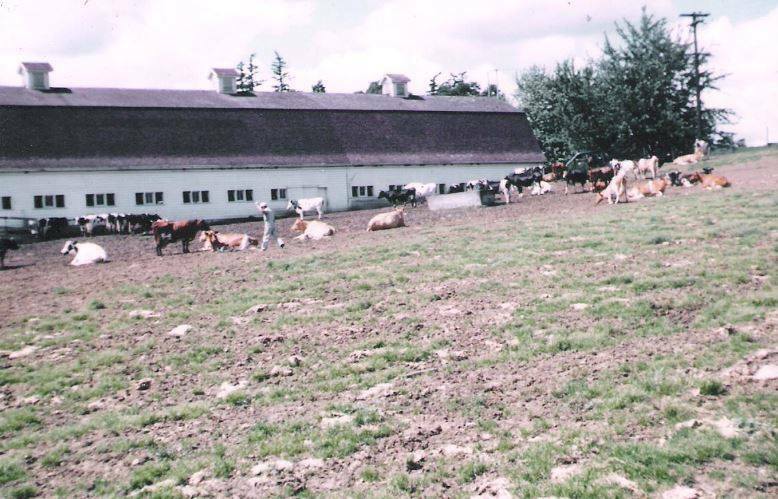 Part of the original Naef Farm, the dairy was located across the “Super 99” (McLoughlin Blvd.) from the Super 99 Drive In. The dairy was founded in 1941 by partners Kenneth Huddle and Ray Stoll – dairymen of Swedish ancestry. The dairy produced raw milk, and occupied the property on the south side of Naef Rd., from the trolley line east to McLoughlin Blvd. The business continued until 1957 when the dairy ceased operating due to a decline in Ray’s health. A 1955 aerial photo shows the huge barn across from the drive in, and Stringfield family photos show it from the vantage point of today’s Stringfield Family Park. 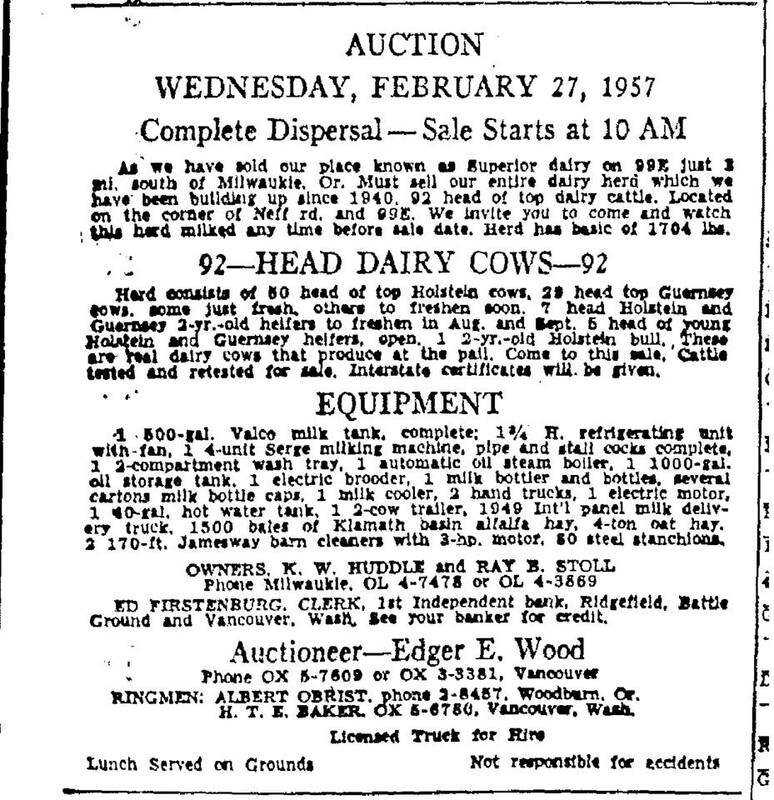 Newspaper articles describe the dairy’s products while it was in operation. After terminating the business in 1957 Huddle removed to the Bend area and started a dairy there. Ray (shown in photos) opened two laundromats in Oregon City and continued residing in Oak Grove. Today the location of the barn and home is occupied by B. Young RV and the Oak Grove Post Office. 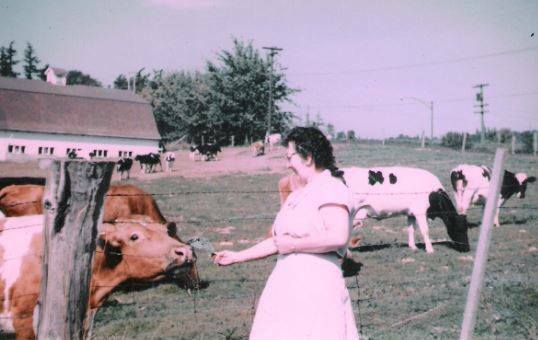 OLHD thanks Robert & Brian Stoll, grandsons of Ray Stoll, for providing us with photos and information about the dairy – as well as Tom & Rick Stringfield for their family photos. Our April meeting will be an important meeting. We are calling it a “Special Meeting” in that our current bylaws specify that amendments to the bylaws can be voted on at a “Special Meeting” called for by the chair. The OLHD board has voted to move forward with OLHD becoming a 501(c)3 tax exempt non-profit organization. Updating and clarifying our bylaws is a first step in that endeavor. As such we will be combining our regular April meeting with a “Special Meeting” for this purpose. We’ll also update our members with the latest history-related local activities, preservation legislation, and upcoming events that we might want to participate in. Recently I have been giving a lot of thought as to OLHD’s longevity, and that of our website. Over the last 10 years OLHD has become a well recognized organization in Clackamas County due to the information on our website, the occasional OLHD postings on Facebook, our occasional presentations, presence at community events, and occasional activism on history-related issues. However, the reality is that we are hampered by the fact that we are not a 501(c)3. The potential of our website meeting the goals of our mission, and the potential of what more we COULD be doing in the community to be consistent with our goals, is limited by our membership and the size of our bank account. Many former members did not renew in October. Unless we change that it will ultimately affect our bank balance and thus our longevity. In considering all of these factors I finally came to the conclusion that OLHD ought to actively pursue becoming a 501(c)3 organization. This tax-exempt status would allow us to receive grants – – grants to improve the website and conduct community projects – – and it would provide us the legitimacy to match what is already the perception. Our website is arguably one of our best mechanisms for meeting our mission and has a great deal of potential that is not being realized. There are also projects within the community that we could be doing, but for a lack of adequate funds. This idea was put before the OLHD membership several years ago, and the consensus then was that it should be looked into. However, for a variety of reasons, it never happened. A week ago I resurrected the idea and put it before the OLHD Board. It was approved by a majority. Based on this OLHD will be actively pursuing obtaining 501(c)3 status with the IRS. I will keep you informed as this process continues, and hope that you will support it. Recently an application was made to the Clackamas Co. Planning Division to install solar panels to the roof of one of our Clackamas County Historic Landmarks – specifically the Isabelle Rupert House. This came to The attention of the Oak Lodge History Detectives (OLHD), and when we investigated we found that the owner had ALREADY installed most of the panels well prior to any decision. Along with the Oak Grove Community Council OLHD responded to the application with a recommendation to deny it based on our belief that the project violated several paragraphs of ZDO 707, the code pertaining to historic preservation. When the Clackamas County Historic Review Board met to discuss the application they also recommended denial. OLHD is pleased to report that the application has been denied, and the specifications in the county ordinance designed to preserve our historic landmarks were upheld. This application has shone a light on two things: 1) Local historic organizations need to be informed when an application pertaining to a historic landmark in their area is presented to the county (they aren’t currently – only through the local CPO), and 2) It is incumbent on the community to stand watch over our historic landmarks, as the county is not in a position to watch over every one of them. OLHD extends a warm Thank You to those that care. Chalk one up for preservation. I’m attaching our Nov. 2018 OLHD Minutes for your review. Please take a moment to look them over prior to our Feb. 14th meeting. 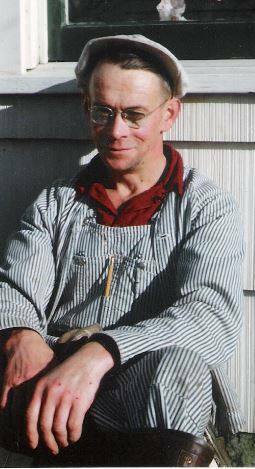 This month we’ll be catching up on history-related Oak Lodge news, learning about historic Clackamas County schools from Richard Craven of the Clackamas County Family History Society, and seeing some of the newest additions to our digital archives from the Naef family. The Oct. 11th Oak Lodge History Detectives meeting is cancelled due to illness. Intended to be OLHD’s “Annual Meeting” the October meeting has been re-scheduled to Nov. 8th. Please mark your calendars. A reminder will be sent out 2 weeks prior.